As long as you are happy to walk around between the helms you get a clear views of sails and course. Being a ‘tweaker’ this suits me fine and I like to have to move around in a crowded harbour, meaning I have less chance of missing something in a blind spot. It’s also nice to get to either the high or low side when under sail. This can be further influenced by the need to escape spray, wind or sun. There is a short run on steering cables or hoses meaning a more direct feel or less weight in heavy hydraulic hoses and oil. The cockpit keeps all it’s space, doors and windows remain a decent size. Most bigger boats have the option of twin cockpit tables meaning you can guarantee a shady lunch (starboard tables in the caribbean can be hotter than hell). Lastly, getting alongside or backing into finger piers could not be easier! There’s no escaping the weather, but that’s why they make sun-hats, long sleave shirts and autopilots. On some designs you might feel exposed, a good bump from a wave and popping over the side feels more of a reality. Access from the transoms can be restricted. Pretty chilly on downwind night passages. In reality, vision can be terrible, a decent headsail and you have a massive blindspot. Sailing is compromised as a single helm means you can only see the sails on one tack, otherwise it’s guess work. Stick your head through the hatch of a hard bimini and you are surrounded by (probably) white GRP -it’s amazing how quickly you can burn here, I was once being badly burned under my chin! Very little sailing feedback -you are out of the wind, possibly on the blind side (on a single) holding a hydraulic helm. The helms also make a big impact into cockpit space and in some cases headspace in aft cabins. Sofa sailing. As close to sailing by XBox as it gets. Like the aft helms you are exposed to the elements though on a well designed boat bouncing over the side isn’t such an issue. Getting to the blind side involves crossing the entire boat and everything you can trip over along the way -not great in a tight anchorage. These are trendy right now with Gunboat taking a Chris White concept and running with it. The offer a great sailing experience for a shorthanded crew and actually work brilliantly for single handers. All the action happens in the pit leaving the rest of the boat free of lines and sweaty crew. When the going gets tough you simple head inside and drive from the comfort of the salon. In the right conditions helming can be a great gig. In a blow, trying to get into Martinique before midnight I learned how miserable life could be. Speeds were high so apparent wind was slamming buckets of water right at me. Head to foot in foulies I might as well have been in the Southern Ocean. Worse still, I knew that in another helm configuration I’d be in shorts and a light jacket. Open the door to take shelter in the salon and a large percentage of ocean followed me. Not good. My other concern is that the helm has no clue to what is going on on the back of the boat, crew could go overboard and you just would not know. Great, really great in the right conditions. Buy very good foul weather gear for the rest. 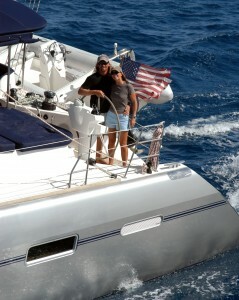 On large yacht (over 70 feet) there is no better option. 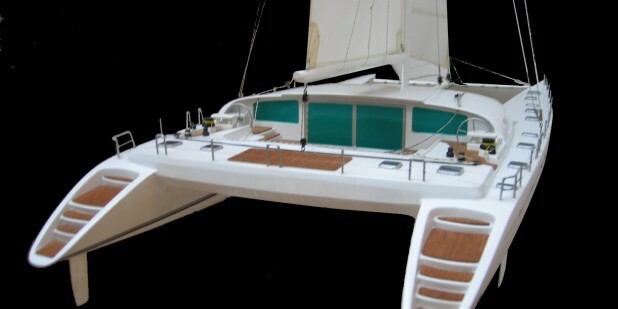 Superior view of the yacht below and this configuration leaves the rest of the yacht free. Chances are there wont be a winch handle in sight so all the lucky Captain will be challenged with is leaning across and pressing the occasional button. There are blind spots but he has crew and cameras to take care of these. Docking could be an issue, but again with cameras crew and remote helms the elevated position is of great advantage. 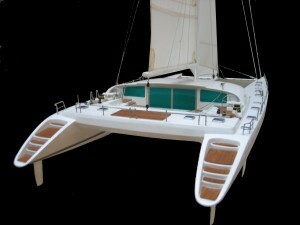 The US charter market has demanded Flybridges on smaller and smaller catamarans. These have offered obvious layout advantages but at the cost of vision, stability and speed. Rigs are smaller as booms have to be so high. Mains have to be easy to use and remote (read flimsy and simple). Climbing to fold a, say, laminated sail into a sail bag is nose bleed material if not physically impossible for most sailors. Centre of efforts are very high even on the relatively low aspect sails the short masts demand. In turn hulls are heavy and much of that weight is up high. Nacelles are low to allow for headroom in the salon making the boats slam in even moderate seas. Cats with external steps up to flybridge are of real concern offshore, all the points above make the boats a lot less stable underfoot, now you have to climb up some slippery steps from which one good roll could send you clear over the lifelines.